My Ateca is coming up to 6 months old and generally, I am very pleased with it. In the summer, I noticed a slightly musty smell and when I checked the carpets, the passenger foot well was a bit wet. It dried out though, the smell went away and I forgot about it. Three months ago, I noticed the smell and the foot well was wet again. I booked it in with the dealer but they didn't have a courtesy car for four weeks. The carpet had dried long before I took the vehicle in. They had the car for 4 days, took the carpets out and checked the sunroof drains but, found no problem after constantly spraying the car with water. They also ran the air conditioning. The dealer acknowledged that there was a problem but, as they couldn't replicate it, they couldn't do any more than suggest that if it happened again, to let them know. I drove away knowing that the problem hadn't been fixed. We've hardly had any rain in the south east for months until recently. We had some showers several days ago and shortly after, I noticed the smell again; the carpet was damp. Today, we had torrential rain and when I went out to my car, the foot well was soaked with water. I will get in touch with the dealer again in the morning but I would be grateful if anyone might know what the cause is. I had that problem with my wife’s car. It was a blocked drain pipe from the AC. The water collected behind the dash and poured out onto the floor when cornering. Easily solved. Thanks for your comment Fred but the air conditioning hasn't been on for weeks. The dealer had tested the air conditioning. We had torrential rain and the car hadn't been driven so I believe it's a water leak. I don't know where from though. I don't know the proper English name for the part, but there's this plastic air duct thing between the engine compartment and the windscreen, with grille on both ends (left and right side of the car, near bonnet hinges). Use the torch and look inside the duct through the grilles, do you see water inside? If there is water accumulated inside, it will eventually start to pour into the ventilation system. There should be some kind of drain in that area, but it may get blocked by leaves etc. Thanks for your comment Tet. I checked the area below the plastic grille but there is no evidence of a blockage; it's very clean in there. I looked in the passenger area again, (in daylight this time), and there was a telltale droplet in the bonnet release recess. It is evident that all the water ingress is passing this point as the carpet on the sill, directly below the bonnet release is wet whereas, the carpet either side is dry. This latest occurrence was after torrential rain and whilst the car was stationary. This leads me to suspect there is a problem in the drainage channels under the bonnet. The dealer's rain test didn’t show up anything but a few buckets of water might help to determine the entry point. I’m not sure whether this is relevant but, there is a hank bush next to the nearside strut fixings that doesn’t appear to be fitted with a bolt from the underside. This is observed by looking through the plastic grille above the strut. Several turns of the shiny female thread can be seen. This could of course be provided for an option that isn’t fitted on my car and may, or may not, be a viable ingress route. I have sent the photos to the dealer and the car is booked in again for Monday 12th. I will post again when they have determined the cause. I would be amazed if it's not to do with the sunroof. I'm amazed VW put them as standard on quite a few models - if they don't leak they rattle. Some do both! We have a couple of Honda Jazz's in the family with the fixed glass roof - that seems good, and I'm sure many people with opening roofs never open them. It's not the sunroof! 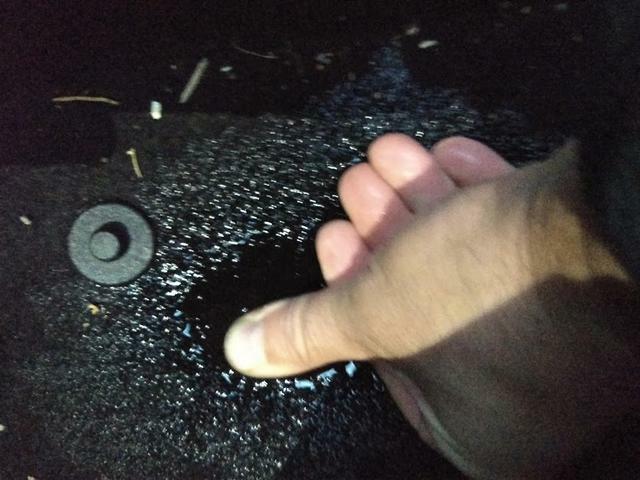 The dealer checked the sunroof seals and drains then did a 3 day rain test without finding any problems. I've driven the car numerous times in light to medium rain without any problems. Since my last post there was a torrential rainstorm so, I sat inside the car and for the first time, watched water pouring in from the gap just above the bonnet lever. The droplets in the photo aren't static, they are fast flowing. The car now stinks like a stagnant pond. I'm convinced this is due to a flaw in the drain system under the bonnet which is only evident when the car is deluged with water. The empty hank bush I mentioned earlier, is still my No. 1 suspect. It sits proud of the metalwork by about 8mm. Under normal wet conditions the rainwater will go around it but with such a heavy downpour, it may get swamped. The car goes back to the dealer on Monday and by pointing them in the right direction, I'm now confident the problem will be correctly diagnosed. I will post again when I get the car back. Fair enough - but I would say the sunroof drains run in that area and 'wet floor' is a common compliant. Water doesn't usually pour in though as it's got to get past the outer sunroof seal in the first place. When it's leaking at home, is the car parked on the level?